He flings the stars into space and speaks in thunder and lightning. He paints the sunset with a brush dipped in flaming light. He stoops to put the perfume in the rose and the sheen on the lily, but His greatest greatness is love. goes out in compassion to her suffering child. Ah, that is the kind of God I need! The stars have a purpose, both as signs and light: And God said, "Let there be lights in the expanse of the sky to separate the day from the night, and let them serve as signs to mark seasons and days and years, and let them be lights in the expanse of the sky to give light on the earth." (Gen 1:14-15). God knows their number and their names. 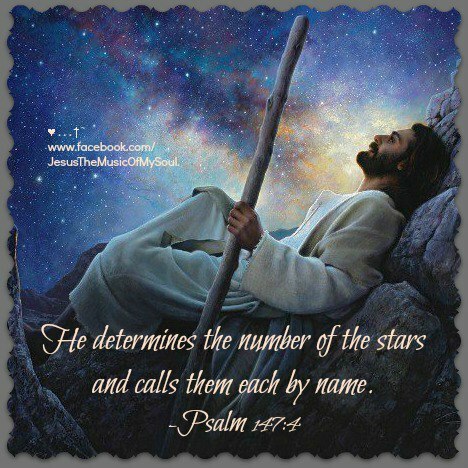 He determines the number of the stars and calls them each by name. (Psalm 147:4). Lift your eyes and look to the heavens: Who created all these? He who brings out the starry host one by one, and calls them each by name. Because of his great power and mighty strength, not one of them is missing. (Isaiah 40:26). The stars are divided into constellations. The stars of heaven and their constellations will not show their light. (Isaiah 13:10). The stars have an order or procession. Who is this that appears like the dawn, fair as the moon, bright as the sun, majestic as the stars in procession? (Song of Solomon 6:10). either between God and mankind or between different peoples on the earth. In Genesis 9:12-13, God put a special sign in the sky. They are somewhat abstract in form. In other words, they don't look exactly like what they represent. For example, the rainbow after a rain is a sign that God promises to not destroy the world again by water. His redeeming work, and his Bride, the Church. and are in harmony with the written Word of God. In fact, many individual star names are recorded in the Bible as appellations or attributes of Jesus. These names are components of larger pictures or constellations which tell a story. There are 12 major constellations. Their modern names, which tell us nothing of their original meanings, are in parenthesis. 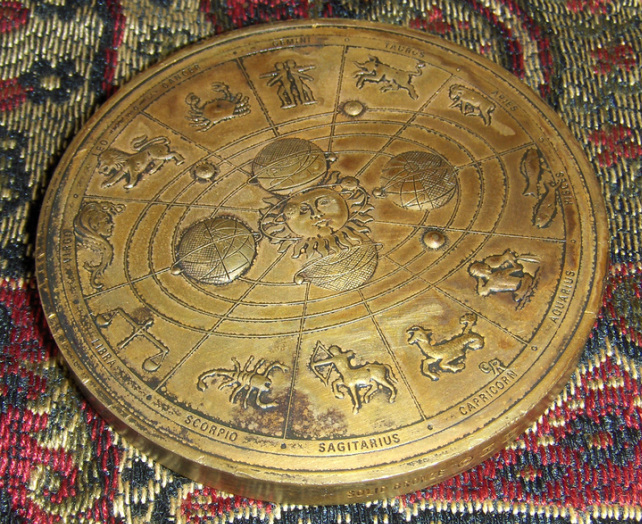 Each major constellation has three other constellations associated with it which modify or complete its meaning. They are called decans. from the Greek word zoad and meaning -The Way or A Path (John 14:6; Psalm 119:105). 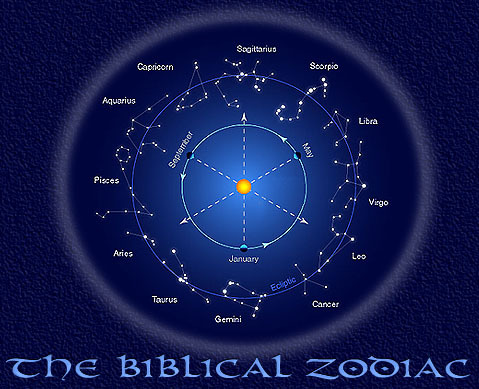 The constellations (stars) in the Bible are like an outline of God's redemption. whereas in God's word - the stars are a worship of God. 2Kings 17:16-18 16 So they left all the commandments of the Lord their God, made for themselves a moulded image and two calves, made a wooden image and worshipped all the host of heaven, and served Baal. and sold themselves to do evil in the sight of the Lord, to provoke Him to anger. for Star names are recorded in the Bible as appellations or attributes of Jesus.